Anonymous : Great book. Worth reading. : For me, this was an informative, readable book. I was sobbing in parts...it's the kind of book that will change you and your perspective on life. I have heard varying stances on certain aspects of Bonhoeffer, and I thought, for the most part, that Metaxas presented in fairness the reasons for those varying opinions. The book made me want to read more on the subject, but not before having a bit of time and space to digest it. 2010-08-15. Good. Ships with Tracking Number! INTERNATIONAL WORLDWIDE Shipping available. May not contain Access Codes or Supplements. May be ex-library. Shipping & Handling by region. Buy with confidence, excellent customer service! 2010-07-05. Good. Ships with Tracking Number! INTERNATIONAL WORLDWIDE Shipping available. May not contain Access Codes or Supplements. May be ex-library. Shipping & Handling by region. Buy with confidence, excellent customer service! 2014-05-08. Good. Ships with Tracking Number! INTERNATIONAL WORLDWIDE Shipping available. May not contain Access Codes or Supplements. May be ex-library. Shipping & Handling by region. Buy with confidence, excellent customer service! 2014-05-08. New. Ships with Tracking Number! INTERNATIONAL WORLDWIDE Shipping available. Buy with confidence, excellent customer service! Paperback. Very Good. SIGNED Thomas Nelson,2017.608pg.ill,b/w pic.Author(Eric Metaxas )signed(dated-nov-5 2017)/inscribed to somebody with note on title page.Unmarked Text.Gift Quality.Paperback 2017 year20th printing .Picture will be provided on Customer Request.100% exact as pictured.Shelf Wear.contains sticker residue on cover.From Private Bookseller collection.Stored in smoke free environment with temperature monitor.100%satisfaction Guarantee.Ships fast.we reply emails 24/7 concerning any issues.We pack every item securely. THOMAS NELSON INC. New. 9.29 x 6.39 cm. Grupo Nelson. PAPERBACK. 1602558655 New Condition. . New. Grupo Nelson. PAPERBACK. 1602558655 Like New Condition. . Fine. Grupo Nelson. PAPERBACK. 1602558655 . New. 2014. THOMAS NELSON INC. New. 9 x 6.09 cm. Thomas Nelson. Used - Very Good. Very Good condition. U.S.A.: Blackstone Audio, Inc., 2010. Audio Book. Good. Audio CD. AUDIO CDs withdrawn from the library collection. Some library markings. We will polish the AUDIO CDs for your satisfaction. You will receive a good set. Enjoy this reliable AUDIO CD performance..
Grupo Nelson, 2012. Paperback. New. 9.09 x 6.1 cm. Blackstone Audio, Inc., 2010. Audio Book. Very Good. Audio CD. 18 BRAND NEW AUDIO CDs. NEW CDS SEALED in the shrink wrap. Just a bit of shelf wear. Enjoy this NEW AUDIO CD performance GIFT QUALITY for your home and library..
Thomas Nelson. Hardcover. 1595551387 Special order direct from the distributor . New. Hardback. New. 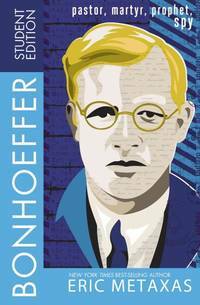 Bonhoeffer presents a profoundly orthodox Christian theologian whose faith led him to boldly confront the greatest evil of the 20th century, and uncovers never-before-revealed facts, including the story of his passionate romance. Grupo Nelson, 2012-10-30. Paperback. Used:Good. In Stock. Always but with confidence. Thomas Nelson. Hardcover. 1595551387 . New. Thomas Nelson. Hardcover. 1595551387 Minor shelf wear . Very Good. Thomas Nelson. Hardcover. 1595551387 signs of little wear on the cover. . Very Good. Thomas Nelson, 2011-08-30. Paperback. Used:Good. In Stock. Always but with confidence. Thomas Nelson. PAPERBACK. 1595552464 Special order direct from the distributor . New. Thomas Nelson, August 2011. Paper Back. New. Grupo Nelson. PAPERBACK. 1602558655 Special order direct from the distributor . New. Nashville, TN: Thomas Nelson. As New. 2010. Trade Paperback. 608 pages . Thomas Nelson. PAPERBACK. 1595552464 Remainder mark . Fine. Thomas Nelson. Hardcover. 1595551387 *BRAND NEW* Ships Same Day or Next! . New. Thomas Nelson. Hardcover. 1595551387 *LIKE NEW* Ships Same Day or Next! . Fine. Grupo Nelson. PAPERBACK. 1602558655 . New. Thomas Nelson. Hardcover. 1595551387 BRAND NEW, GIFT QUALITY! NOT OVERSTOCKS OR MARKED UP REMAINDERS! DIRECT FROM THE PUBLISHER!|1.85 . New. Grupo Nelson. PAPERBACK. 1602558655 Minor shelf wear . Very Good. Grupo Nelson. PAPERBACK. 1602558655 signs of little wear on the cover. . Very Good. Thomas Nelson. PAPERBACK. 1595552464 signs of little wear on the cover. . Very Good. Thomas Nelson Inc. Student. Teens & Young Adult. New. Brand New: This item is brand new unopened, never used and still in its original manufacturer condition.